ASP.NET Interview Questions: - Can you explain Post Cache substitution? This is one of the asked ASP.Net Interview Questions during the Interview by the Interviewer. Call the new Response.WriteSubstitution method, passing it a reference to the desired substitution method callback. Add a <?xml:namespace prefix="asp"><?xml:namespace>> control to the page at the desired location, and set its methodName attribute to the name of the callback method. You can see we have a static function here "GetDateToString()". We pass the response substitution callback to the "WriteSubstitution" method. So now, when ASP.NET page framework retrieves the cached page, it automatically triggers your callback method to get the dynamic content. It then inserts your content into the cached HTML of the page. Even if your page has not been cached yet (for example, it's being rendered for the first time), ASP.NET still calls your callback in the same way to get the dynamic content. So you create a method that generates some dynamic content, and by doing so you guarantee that your method is always called, and it's content is never cached. Ok the above example was by using "WriteSubstitution" now lets try to see how we can do by using ">" control. You can get the ">" control from the editor toolbox. 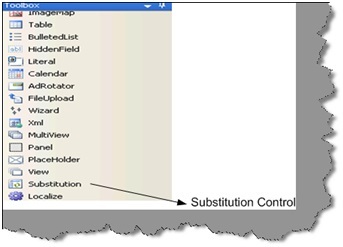 Below is a sample code that shows how substitution control works. We have ASPX code at the right hand side and class code at the behind code at the left hand side. We need to provide the method name in the "methodname" attribute of the substitution control. 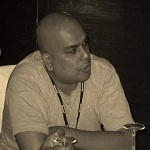 From more on author's blog related to ASP.NET interview questions click and visit.